May 31, 2016, 11:58 a.m. The rise of mobile adblocking may not be burning publishers in the U.S. so far, but the story is very different in Asia. 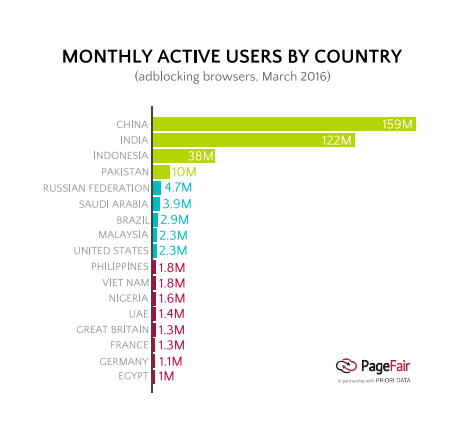 Countries such as China, India, Indonesia, and Pakistan are leading the adoption of mobile adblocking with roughly 36 percent of smartphone users in the Asia-Pacific region using browsers that automatically block ads, according to the latest report from PageFair. In China alone, there are an estimated 59 million users of mobile adblocking browsers, and 122 million in India. While 55 percent of the global smartphone userbase lives in the region, it represents 93 percent of the adblocking-browser usage, says PageFair. China and Indonesia are countries where mobile data is expensive, and where mobile networks and devices tend to be slower, according to Johnny Ryan, PageFair’s head of ecosystem. He pointed out that the most popular adblocking browser is Alibaba’s UC Browser, which has seen wide adoption in many of the countries with the highest mobile adblocking penetration. The overall mobile adblocking userbase, now at 419 million people (or 22 percent of the world’s 1.9 billion smartphone users), represents 90 percent increase from January of last year, according to the report. Twice as many people are blocking ads on mobile as on desktop, a phenomenon driven by emerging markets where smartphones dominate for Internet use. It’s worth noting, as it always is when a new PageFair report drops, that the company makes money by helping publishers circumvent adblockers. 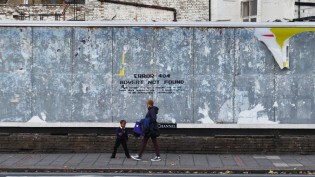 It, in other words, has something of a vested interest in making the adblocking problem seem larger, not smaller. When we covered the questionable threat mobile adblocking in December, we saw that while mobile adblocking was a small concern for Western publishers, the real threat was desktop adblockers, which threatened more of publishers revenue. The likes of The Guardian and Condé Nast were seeing mobile adblocking rates in the low single digits — far lower than what publishers in Asia are seeing. Perhaps they should consider themselves lucky. Bilton, Ricardo. "Asia is leading the adoption of mobile adblocking; North America is dodging the bullet (for now, at least)." Nieman Journalism Lab. Nieman Foundation for Journalism at Harvard, 31 May. 2016. Web. 18 Apr. 2019. Bilton, Ricardo. "Asia is leading the adoption of mobile adblocking; North America is dodging the bullet (for now, at least)." Nieman Journalism Lab. Last modified May 31, 2016. Accessed April 18, 2019. https://www.niemanlab.org/2016/05/asia-is-leading-the-adoption-of-mobile-adblocking-north-america-is-dodging-the-bullet-for-now-at-least/.